Japan-based startup Mira Robotics has some statistics in mind. By 2035, said the company, 1 in 3 Japanese citizens will be elderly. Other parts of the globe will be facing low birthrates and aging populations too. Mira Robotics sees the business opportunity to offer service robots that can give daily assistance for the elderly and infirm. "We believe that the demand for household chore assistance among dual-income households and the elderly is rising further," said Mira Robotics' CEO, Ken Matsui at an unveiling event. First step center-stage belongs to their newly announced ugo household service, which consists of a remote control robot. A video posted by The Japan Times earlier this month shows their robot as laundry helper. The robot can take clothes out of the washing machine, put them in a laundry basket, and then place them on a drying rack—and finally fold them, piece by piece. Even though the robot is correct and efficient in grasping and moving items, it is slow; your ears ring and fingers tap wondering if the video is ever going to finish, instead of wondering when this device will come to market. Mira Robotics nonetheless was able to demonstrate the three actions: removing clothes from washers, hanging them up to dry, and folding them. In the process, the video demonstrated the abilities of this robot to use its two arms well, and to elongate itself when needed to reach desired heights. For example, when it comes time to move over to the rack and place the towel on the top rung, the robot elongates itself to reach the rung. The weight is about 158 pounds and the height is adjustable. The robot has 3 cameras, a microphone and speaker. It has Wi-Fi and LTE connectivity, said Evan Ackerman in IEEE Spectrum. 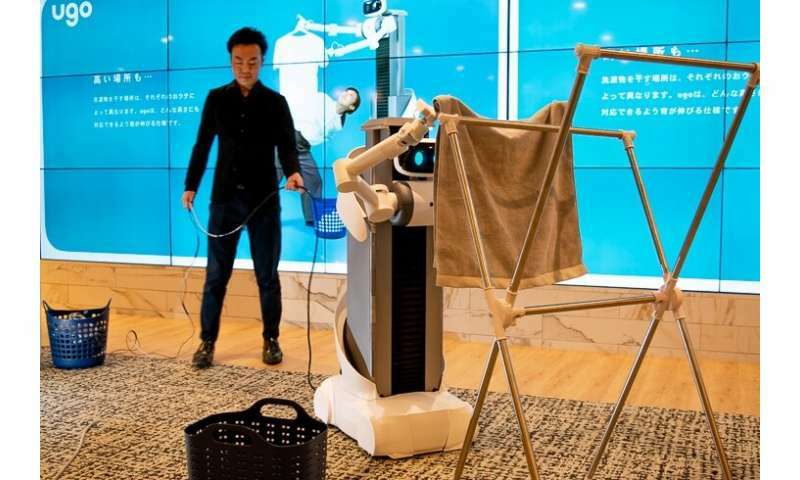 The Japan Times reported that the new service, ugo, hoped to resolve two "major hurdles" that have prevented the widespread adoption of services that delegate housekeeping chores to humans. The two stay-aways have been privacy and prohibitive costs. So, the startup is asking, why lament not being able to afford a housekeeper at home when a robot service might be affordable? Mira has in mind a business model of robot rentals. The ugo-service robots would be rented to customers for use in their homes. Trained operators would remotely manipulate them to do laundry chores. Ackerman walked readers through the fee plan. "Mira's business plan with Ugo is that you'll rent one that lives in your house for somewhere between US $180 and $225 per month, with the expectation that you'll want it to be doing housework for several hours each week. You request that the robot complete a task, and a 'professional operator' will connect to the robot and get to work, disconnecting when they're finished." The two-armed robot was developed last year, said The Japan Times. The company envisions services beyond just laundry. Matsui, whose specialty area is robot engineering and software, said in a video that such a service could apply to other household tasks, such as picking up delivered packages or it could change a pet's pad, for those with companion animals. In a video, Koichi Morimoto, at a news gathering, brought up another interesting perk, and that was that the operators could work from their homes. He said, "Even people with minor disabilities who are not able to visit a client's house could work with this setup." Morimoto said, "We would like to create that type of new workstyle with Mira Robotics." What's next? A closed beta test is in the works, in August. The service itself is planned for launch in May 2020. Moving forward, the snail's pace-issue will be addressed. "During the folding process, Matsui said the time it takes for the robot to do the job will be shortened by revamping the arms and the way they are manipulated." In addition, Matsui defined the remote control aspect of the robot as "step one." Ackerman reported that longer-term, the robot could start doing some tasks autonomously, and eventually, they hoped to transition to full autonomy.